The Inspiration... This fabric is stock #54038-14 by Moda Home called Storytime in Robin's Egg Blue. I call it my Bananafana-ized Pink Fig Dress. 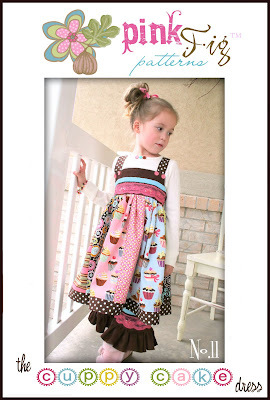 ;) I used The Cuppy Cake Dress pattern by Pink Fig for the overall base of the dress. 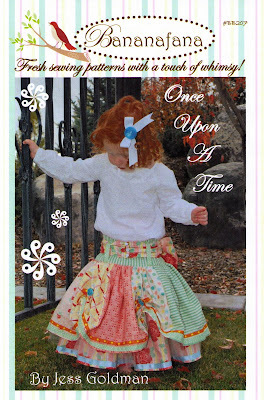 Then added some of the design elements from the Once Upon a Time skirt by Bananafana. The Pink Fig pattern has shirring for the back of the dress and I am not a big fan of shirring. Don't get me wrong... 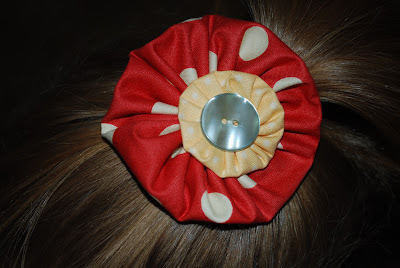 I think it is cute, but I don't care to do it myself. SOOO... 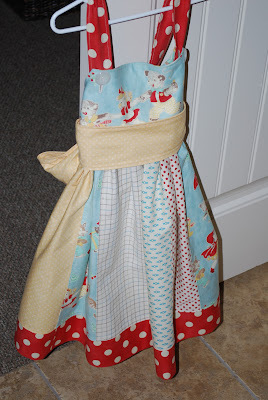 I skipped that part of the pattern and made a more tailored back and Bananafana-ized it by adding a big bow that wraps across the front of the dress. Paige now has a cute new dress... I think she likes it... what do you think? I think she is loving it! Very cute! You are so good at what you do... I wish I could create some of the cute things that you create! I may have to come to you from time to time to ask if you can whip something up for my Cameron! ;) Any way, have a great day beloved and I hope to see you soon. i think it's the cutest thing EVER!!! 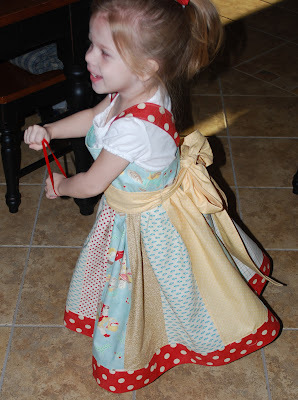 i need to make a dress for my melanie. your daughter is a doll. 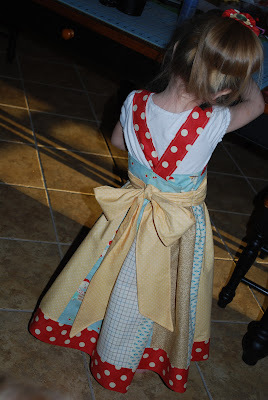 Oh that dress is adorable! Very cute. That's adorable! It makes me want to run out and grab some material right now! Oh, makes you wish for more weekends!!! She is darling, and the dress makes her even more precious! 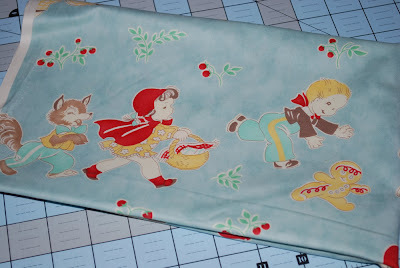 I LOVE that inspiration fabric, it would make such a great childs quilt or even a baby room inspiration fabric, curtains, bumpers, you get the idea! Oh so cute! And as a boy-mom... I'm a twinge bit envious too! Paige's dress is adorable. You've done a wonderful job. Love the fabrics. Darling!! I think she likes it!! I love your dress! I love those Bananafana patterns! SO CUTE! That is the cutest dress. I love the fabric. 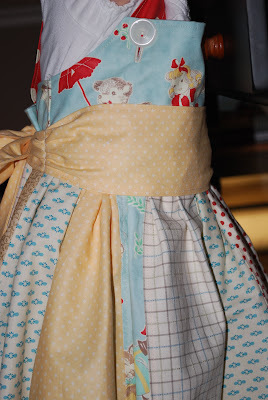 Very cute dress, love the fabrics. Also wanted to know if you received my package for FQ Swap. I mailed it on Feb.23. That is the absolutely cutest dress ever!!! Wish my girls were younger (well, maybe)! I love the yellow polka dot...is it still available? Oh I just love this dress and she is darling in it. Oh my goodness Angela. Clearly I need to add you to google reader--look at all this cuteness I've been missing!! Would you drop me an email when you get a chance? 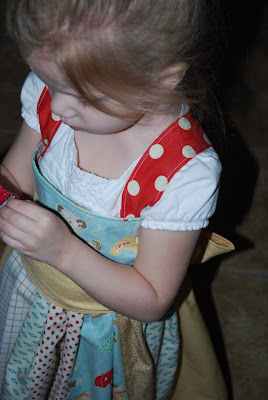 I had an idea for the bake shop blog that I wanted to run by you. Thanks!